The Samurai Archives Citadel // View topic - Komuso sect and attire? Posted: Tue Jan 05, 2010 4:17 pm Post subject: Komuso sect and attire? I'm working on a komuso character design and I was wondering if anybody might be able to answer a few questions about their garb. First, I've found a few variants in the general color scheme (mainly, predominantly white with some black elements, and the inverse) and was curious as to the differences between them. Do/did they reflect different sects or regions? On a similar note, there are variations as to what (if anything) they have written on the front of their "smocks" (actual term?). The most common I've seen is 明暗 ("light & dark," or "shading" according to my dictionary) and some longer ones I cannot distinguish. What significance do these characters hold? I assume they are of Buddhist origin/application, but where/why would you see one or another (or blank)? Also, any other color variation significance? Posted: Thu Jan 07, 2010 2:50 am Post subject: Re: Komuso sect and attire? Not to my knowledge. Usually color differences were mainly attributable to the fact that monks would use whatever material was available to them-black for the most part, but more of the outfit would become white if they had an abundance of white cloth on their hands. The general design would be largely up to the skills of whoever was sewing their robes-many times the individual monks themselves. I was wondering if that may have been the case, thanks! Posted: Sat Jan 09, 2010 5:02 am Post subject: Re: Komuso sect and attire? The box they carry around their neck is called a gebako 偈箱 "verses box". They put in it sûtra, music parts, or money they begged. Most of them are shown with those kanji 明暗 myô-an written on it. It designates the name of the temple they comme from, in this case Myôan-ji 明暗寺 in Kyôto. There was two other known Fuke-sect temple : Ichigetsu-dera 一月寺 in Shimôsa province, and Reihô-ji 鈴法寺 in Musashi. They were allowed to wear a wakizashi as any heimin would when travelling. The also didn't have to shave their hair as monks usually did. What about the "sash" they wear over one shoulder, is it just a kesa (or perhaps rakusu, I think I just answered my own question)? Oh yeah, one last thing about the gebako; in most of the photos they are clearly wooden boxes as Akaguma mentioned, but in a few images (especially woodblock prints) they seem more flat and to be made of fabric. Any thoughts? This sash is their version of the kesa. It's a big rakusu 絡子 called a ô-kuwara 大掛絡. Whereas rakusu does look like a flat fabric bag worn around the neck (but it is not a bag !). On this picture, the gebako also looks like a box. Here is a chanbara-like komusô I've drawn. But the two in the first pic (especially the one on the right) appear to be flat. Perhaps it's just the lighting and B/W photography. Once again, Akaguma, thank you for taking the time to help out to such an extent! 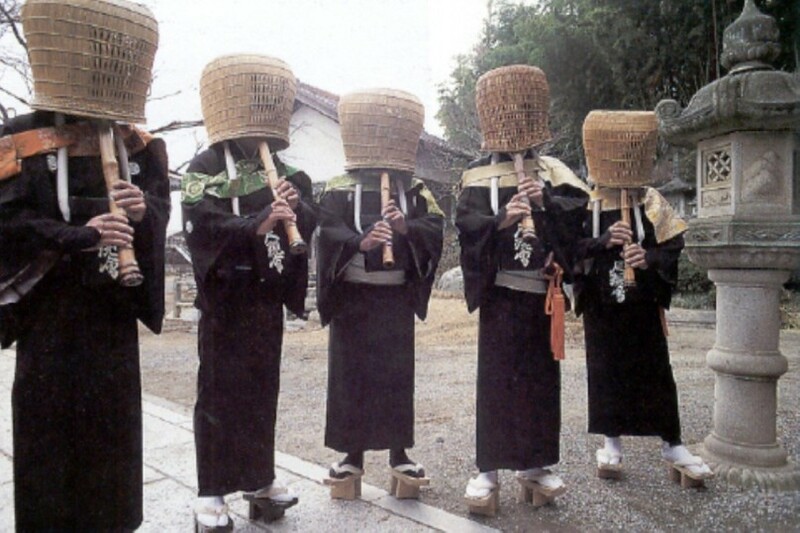 What is the significance of the Tengai? Why did they wear this unusual headgear? It is very interesting and unusual headgear and I am curious as to the reason that this was worn? I did a really quick Google and but didn't find anything specific. The idea behind the basket-like hat was anonymity -- the "self" didn't matter. In the process, they became great disguise fodder for spies, killers, and other bad folks.